Bennett Hydraulic Trim Tabs Bennett Trim Tabs are designed and manufactured at the Bennett Marine plant in Deerfield Beach, Florida. Every Bennett system carries with it an accumulation of nearly 40 years of research, development, and testing and is designed to provide years of dependable service. Every trim tab is sheared and bent - not welded. Welding alters the properties of stainless steel which invites corrosion. 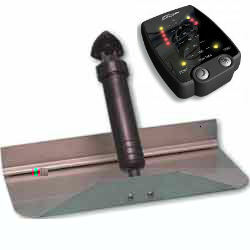 Bennett actuators feature patented through-hull hydraulics. There are no vulnerable external hoses to decay. Plus, every Hydraulic Power Unit is tested by both person and computer to insure this reliable unit deflects the trim tabs, holds firmly during use, and retracts smoothly. A DO-IT-YOURSELF INSTALLATION Just a few hours and some common tools are all that is needed. Components of the Bennett system are designed and packaged with the do-it-yourselfer in mind. Every kit is complete, featuring one page step-by- step instructions, with templates, for a simple, precise, and satisfying installation. Tab Position Indicator Description: Attractive, compact, water resistant and easy to install. The TPI helm display accurately shows deflection percentage of each trim tab, and the LED brightness is adjustable for any lighting condition. Works with all Bennett Trim Tabs.